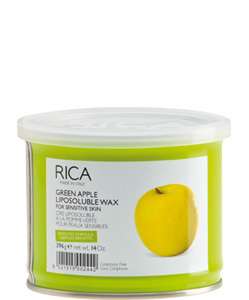 Delight your senses with Rica Green Apple fragranced wax. Extract of apple provide the crisp scent which, combined with a soft, smooth after feel leaves a lasting impression. It provides the crisp scent which, combined with a soft, smooth after feel leaves a lasting impression. A luxurious scent to delight your senses. Its velvet texture and pliability ensures a smooth, silky finish.